My wife is always trying to make me take walks. After dinner, or before dinner, or on the weekend, she loves to walk. It’s not that I don’t, it’s just that I don’t like the idea of walking – especially on weeknights. Once I’m out there I enjoy the fresh air, the blood rush, the smells and sounds. It’s just the process from couch to door that needs a little work (being a bit oppositional defiant doesn’t help). Weekends I’ll plan a walk into a daily outing, or pick a new trail to take the family exploring. Walking as a destination makes sense to me. Making it a regular occurrence is hard. But once a year? Even I can get behind that. Whether you’re with friends or family or both this holiday season, making a short post-meal walk part of your new tradition has a variety of benefits. Not only will it help you digest, it can even improve blood sugar levels, lower stress levels, and create an opportunity for exchanging stories and strengthening community. Whether walking after dinner becomes a family tradition, or is just a once a year thing, it’s a good habit to start during this season of eating and general over-indulgence. If you’re looking for a good stroll after your holiday meal (or anytime), look no further than King County’s Regional Trail System. 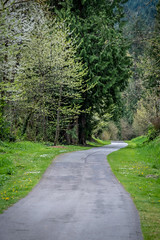 With 175-miles of trails throughout King County, chances are there’s a trail near you. Looking for a good walk? Try our new Trail Finder to locate a Regional Trail within walking distance, or a quick drive. Grab your jacket and strut out that stuffing, your stomach will thank you for it – that is if you don’t go back for more!